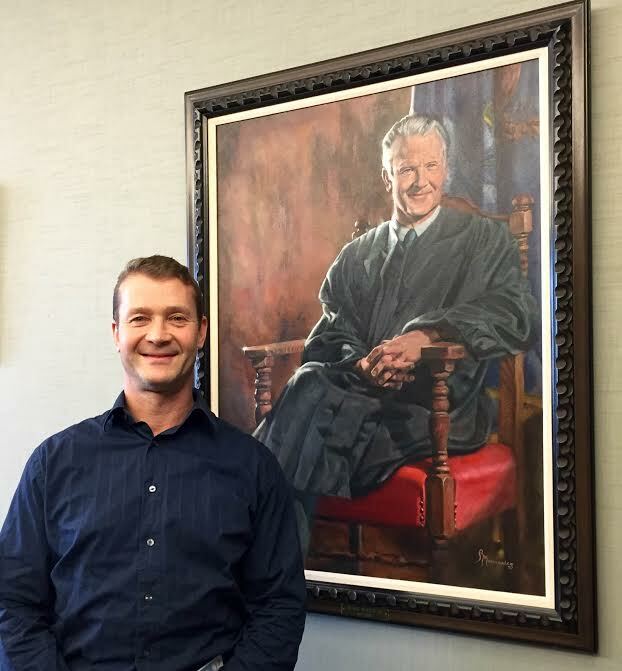 Peter Moody stands beneath the portrait of his father, Justice Blair Moody, Jr., on Wednesday, January 20. Mr. Moody was at the Hall of Justice for a seminar. Peter Moody was only 17 years old when his father, Michigan Supreme Court Justice Blair Moody, Jr., passed away unexpectedly. Mr. Moody is now a father and attorney who aspires to live with as much energy and dedication as his father before him. Justice Blair Moody, Jr. was born in Detroit on February 27, 1928, but grew up in Washington D.C. His father, for whom he was named, was the Washington bureau chief for the Detroit News and later a U.S. Senator, appointed by Governor G. Mennen Williams. Justice Moody studied at the University of Michigan and worked as a reporter for the Detroit News and Washington Post during the summers. He married Mary Lou Kennedy and the couple had five children: Diane, Blair, Susan, Brian, and Peter. As a father, Justice Moody coached his children’s teams and was involved in all of their activities.